HAVE YOU GOT WHAT IT TAKES TO BECOME A MASTER OF S.E.U.C.K? STOP: Entries have now closed. 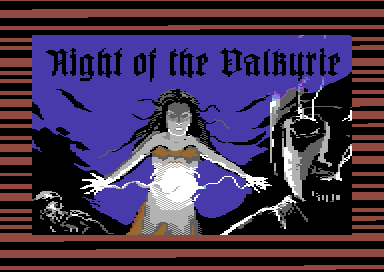 This is a utility which was made back in 1987 by Sensible Software, and it was originally published by Palace Software (As full a price product on disk+tape), Domark (As a Toolbox package which came with the 'Light Fantastic Pack' of the Commodore 64, and GBH (Gremlin Graphics) as a £4.99 budget software title back in the early 1990's. 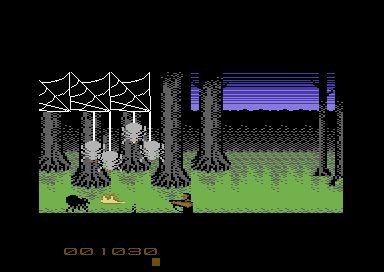 SEUCK was also released on Atari ST and Commodore AMIGA, but differed slightly to the C64. 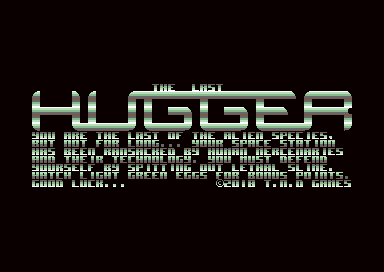 This competition is C64 only! 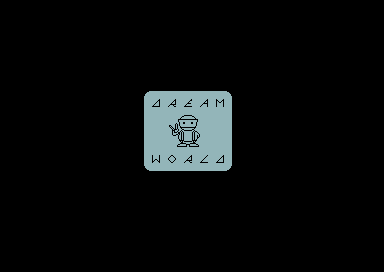 SEUCK allowed people be really creative and design brand new Commodore 64 game creations, without the need of programming. 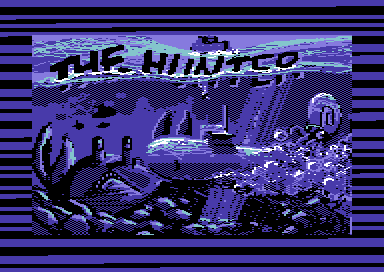 In order for the user to create a brand new C64 game, a series of built in editors crammed to one file. You can create your own sprites, and create actual objects as players, bullets, deaths and of course the enemies. Then later on, you could design and construct your very own in game background, with use of the characters, tiles, and map editor. You could also setup player limitations (lives, length and height of play field, collision type, etc). There is also a very simple level setup. Also there are limited attack waves patterns, where you could insert new enemies or link existing ones to build a boss, etc. The title Screen editor allows you to edit the score panel chars, and title screen chars and also place chars into the title screen editor. So that you can have your own title screen editor. 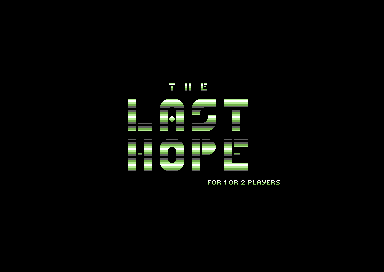 The Last Hope by Gaetano Chiummo ... Made using SEUCK. In the leap year of 2008, the Sideways Scrolling SEUCK was built. Jon Wells managed to build a special version of SEUCK which can scroll SIDEWAYS instead of DOWNWARDS. There is only one version of the SIDEWAYS SEUCK at the moment, which is the Sideways scrolling LEFT version of the tool. A version to scroll the other direction was mentioned back in 2013, that it will go ahead, but time constraints is the major issue. You can find Jon Well's Sideways SEUCK here. Which is absolutely free to download from his site.. Between 1987 to the present year, people around different parts of the world have been creative and made SEUCK game creations. 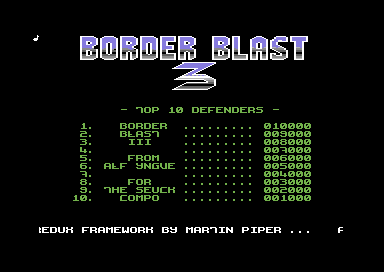 A lot of the games were too much rushed, but there were also some TOP QUALITY SEUCK titles, which had no enhancements (or did have the odd new subroutine added to it). The games appeared on different C64 magazines and fanzines on cover disks, and cover tapes. What about the SEUCK Compo? The SEUCK compo has been going on for many years, since the early 2000's. The first SEUCK compo was hosted by someone called AKIRA, who hosted Shmups.com, at the time. Since time was a major issue, and (should I have remembered correctly) the author lost interest in the compo. I was given kind permission to host the SEUCK compo. The SEUCK compo has been continuing, although there have been breaks in between years. The aim of the competition was originally create a new SEUCK game without enhancements, or anything in particular (apart from music). This was until 2014, onwards, where I allowed mods and minor enhancements to be added to your own SEUCK creations. Such as huge sprites, sprite/behind background priority Now come 2018, this compo is brand new, and major changes have been made. The SEUCK Compo 2016 went slightly over the beginning of 2017. That was the reason for why there was no compo in 2017, unless you can count on the Spanish SEUCK Compo 2017 run by Errazking. Examples of compiled games are downloadable by clicking on the images below. The aim of this year's compo is simply to create a vertical scrolling or a horizontal scrolling shoot 'em up, which should stand out from the crowd. We don't want to see rushed out games, which were made in a series of less than a day, or really rushed graphics. We want to see real stunning SEUCK games, with really smart graphics, and also games good attack wave patterns, end of level bosses, etc. The creation will be in your hands. Can your game stand out? If you think it can, then please read on. The first choice of theme chosen is Science Fiction/Futuristic. The type of game to suit this theme can be practically anything related to Sci-Fi horror, or just any futuristic space blaster (or a futuristic combat game. If you are making this sort of game, make sure the game uses a futuristic / sci-fi style background to it. Examples of sci fi style games can involve space ships, aliens, robots, scientific experiments that gone horribly wrong, etc. Split Second by Alf Yngve is an example of Science Fiction based on the after effects of time travel. 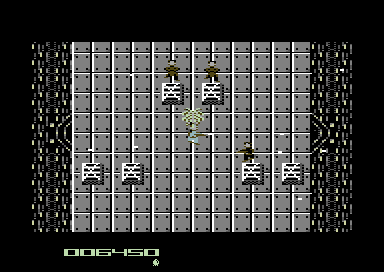 This game had you controlling two versions of Joe Rubicon, who was injured during the time wars. Two different times emerged into one, and he finds himself fighting in two different realities. 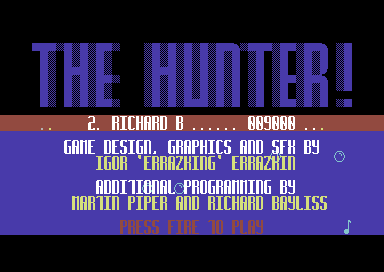 This game almost won 2016 SEUCK compo, but it has been decided by the voters that THE HUNTER won the modded addition to the SEUCK Compo. Sheer Earth Attack by Gaetano Chiummo is an example of another Sci-Fi theme, created using Sideways Scrolling SEUCK by Jon Wells but this time based in space. This game won the 2013 SEUCK compo and was rewarded new presentation and power ups. 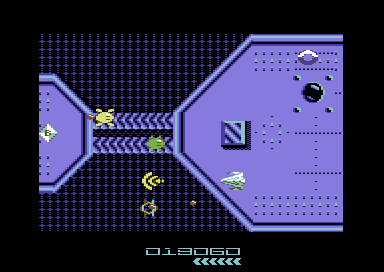 It features mean alien space ship bosses, and pretty slick game graphics. 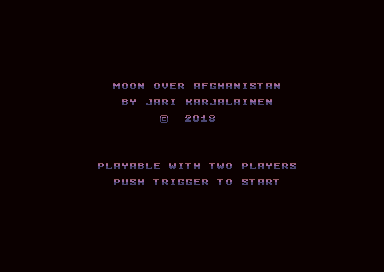 This is a little space game, deeply inspired by classic Shoot 'Em Ups, such as Nemesis (Gradius), I-O, and a few others. The second theme is Fantasy/Adventure. This is where your games can be based in another enchanting world. The game could involve wizards, dragons, witches, monsters, knights, maids, or anything fantasy based. Some type of games which would fit this theme would be a game, where you fly a dragon across an enchanting world, trying to destroy the spells cast by an evil wizard. Or maybe a fantasy war game, where you are a warrior, who has to battle against the enemy forces of monsters, armies or an evil prince. Your game idea, based on this theme should be up to you. God Slayer by Jefferey Oullette is an example of fantasy. You are a brave little knight, who must battle against the demons inside an ancient castle. The game features some very nice cute cartoon style graphics, and some very good gameplay blended inside the game. I strongly recommend that you check this game out for certain ideas. Hero Time by IndyJR is yet another good example for fantasy. Play the role of a poor peasant, who eventually becomes a hero, who tries to rescue prisoners from a deadly guards and battle against other monsters. 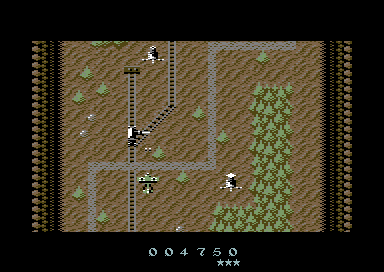 This game has a reduced sized game area, which reminds me of the classic C64 games,such as Commando. 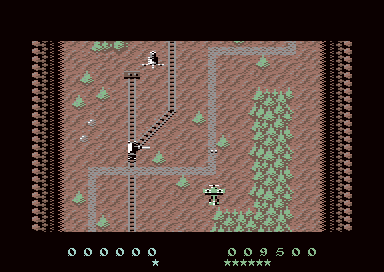 The game is nicely presented and has a very high difficulty in game play. C'NOTTE D'KNIGHT by Aldo Chiummo, is also an example of cartoon fantasy, where you play a brave knight, who must rescue the princess. He has to climb up castles to rescue the princess from the clutches of an evil guard. C'Notte must fight against enemy guards and also demons and dragons. This game looks as if it was inspired by Fire Trap by Domark. Not only would the compo should have games with outstanding game graphics.The compo should also have a well-designed front end, to make the game more attractive. This can be done in different ways (Depending on how you'd make a presentation). A lot of previous compo entrants have been designing their own SEUCK game front ends by doing some excellent, but limited design to their games. Certain characters in the SEUCK char editor was used to make single chars to help form and produce logos. This is one thing I sure will be looking for in the compo. 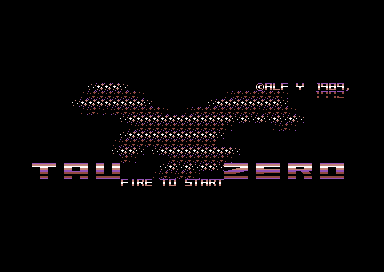 :) An example front end below is Tau Zero by Alf Yngve. This game was made way back in 1989/1992. 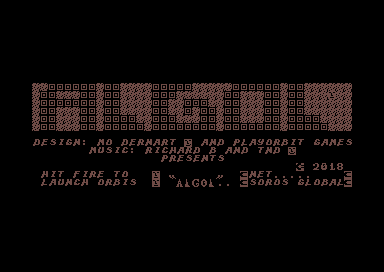 Also accepted in this year's compo are programmed additions added to your SEUCK Game. These may be in standard SEUCK, or SEUCK Redux. That's right! SEUCK Redux IS allowed to be used this time round! If you make a new front end for your game. Please make sure that it has a nice logo to stand out, and also additional text presentation. Hi-Score additions and other bits are also welcome. 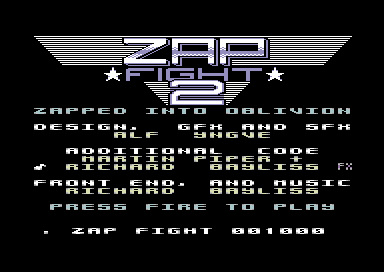 An example below is the front end I made in SEUCK Redux for Alf Yngve's Zap Fight 2. - Full tape master with loading picture and chosen loading stripes theme. - Fully enhanced version released in the compo prize pack (as usual). - Entries are allowed to be in Standard SEUCK or Sideways SEUCK. SEUCK Redux is also accepted. - All entries must be your own work (Unless you are working with a group, with your production). - Entries are preferred to be packed/crunched and runnable from BASIC. Submissions from save finished game state are also okay. I can fix the game up for you and put it together before uploading it on to the compo page. Raw versions of the game will still be used in the compo. - Entries automatically have title music added to the games (Normally composed by me). If you don't wish this to happen. Please let me know. You also can choose music from the demo scene/public domain to be added to the game title screen, should you want to use it? - Maximum of 3 entries allowed in the competition, as always. - Entrants SHOULD stick to the themes of SCI-FI/FUTURISTIC or FANTASY/ADVENTURE. If however you cannot make a game using this particular theme. I can still accept your entry into the compo. - Try to vary your own attack waves in the game. We don't want to see the same old typical enemy just move down the screen all the time. - Entries could at least have a collectable object which (later on) can be reserved as a power up collectable (as main prize) - Although this is not compulsory. - Use of the TND SEUCK framework, or SEUCK Redux is very welcome although not compulsory. - Old unreleased SEUCK games of your own are accepted. - Only if they don't appear elsewhere on the Internet and that they stand out well. I will check for any existing releases before evaluating the compo entries. - Submissions can be PAL or NTSC compatible (PAL is preferred). - Entries may be split into separate parts, should you wish to make something big for the competition. If you need a password system for your game, please feel free to use any Public Domain password maker tools, such as JCH CODER, etc. or ask me to link a pass code routine on to your game before it gets uploaded. - The organizer of the compo is also allowed to participate in the compo, just for fun. - Do not use your entry to exploit other individuals or groups or cause any form of conflict or upset. - Do not use obscene material, such as swearing, scenes of adult nature, etc. - Try not to make your game too short. This will be classed as a playable demo/preview. Although we will accept demo games. - Try to not put in too many sprites on the same screen. This will cause SEUCK slowdown syndrome. - Do not rip logos and assets from existing demos, games, etc if they are not classed as your own work.Recycling of your sprites / background graphics from existing games of your own work is okay. - All entries must be exclusive for this competition, and not have been seen elsewhere. Please do not upload on to CSDB until after the entry has been uploaded on to this compo page. - NO SELF-VOTING when the voting phase takes place. If the game is yours, when you're voting it must be marked as a '0'. The scoring is inspected thoroughly. - Updated submissions of previously released games might be accepted, depending on how long your game has been uploaded to the entries page for. - Entries submitted and checked will be available to download if suitable after evaluation. 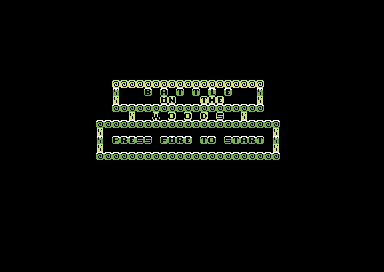 .. All entries will be mastered to .D64 and also to TAP (for tape fans) with the usual IRQ turbo tape loader. - Last submission date is 30th June 2018 with no extended deadlines after that date. - Votesheets will be available some time after the closing submission of the compo. You are the last of the alien species, but not for long. Human Mercenaries have boarded your home and brought state-of-the-art technology to put an end to your species. Only armed with slime, your mission is to fight the mercenaries, and destroy their technology. Hatch light green eggs to spawn more of your species, but don't even think about hatching the dark green eggs. (Warning due to the additional in game enhancements added, boss stages and large enemies consist of flashing background, which some gamers may find to be uncomfortable!). Headquarters in a Aldebaran informs us that multiple planets in Quadrant WOL-NR2 have been aggressively occupied by the Extanoids. They have already eliminated or expelled the native populations as well as erased all databanks. Your mission is to navigate through The Hive and destabilize their control center. 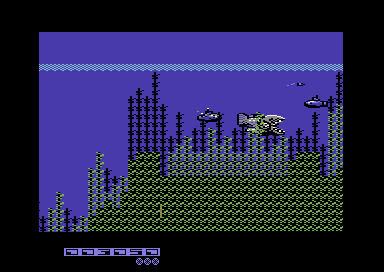 Fly your plane through 6 different zones, battling against the enemy forces. Collect airships in order to gain power ups. Once enough power ups have been picked up, you will be able to shoot fireballs at the enemies. In order to complete the game, you must accomplish 3 targets, which are all indicated before each mission starts. At the end of each level will be a giant airborne boss, in which you must defeat in order to progress further. If you succeed with your mission, you will be rewarded a 4-lettered password for the end sequence. Fail to attain your targets, then the game will automatically be over. The chosen child of NRAR, trained in the cosmic future art of 'rabbitfighting' (aka ghosting) teleports to Earth, year 9634, to recover an ancient and holy relic, lost years past after the cataclysmic shattering of its homeworld --- scattering its souls and sacred treasures throughout the interstellar universe. The scene of planetfall - a dangerous and frighteningly dystopic future where madness and technology have joined in an electric world ruled by the mysterious Doktor Gigglesmith. 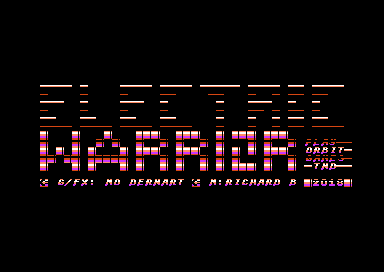 This child is you and your destiny is to become... the ELECTRIC WARRIOR. Control the Orbis aka "The Harvester of Doom," from the Soros System. Invade, subjugate and destroy the planet of Eden. So, as a punishment, our little super-hero will not get any gift for Christmas! He goes to bed in tears, but the Toy Fairies can't stand and watch him crying, so they decide to send him to the "Dream World", where he can get any toys he wants! The problem is, the "Dream World" is full of angry toys and other dangerous things which will try to stop Super George and let him wake up with empty hands. Anyway, our hero can throw marbles against them, but some are stronger than others, and some are invincible. There are three stages: the Garden, the Field of Grain and the Winter Playground. George must get the toys while shooting his enemies and avoiding their "bullets". He can climb trees, ropes, and so on. In each stage there are some extra features that will grant George 2.000 points: it's up to you to discover where they are and how to get the points! Will you help Super George in his quest? Her own personal armored tank! She spray-painted her tank pink, drove it to school the very next day -- and instantly became the most popular girl. First they started to call her "Panzer Patty." Then they tried to sabotage her tank. That's when all-out war broke out between Patty and the Forces of Darkness Sorority. It was, like, total mayhem in the suburb... and everybody took awesome selfies. 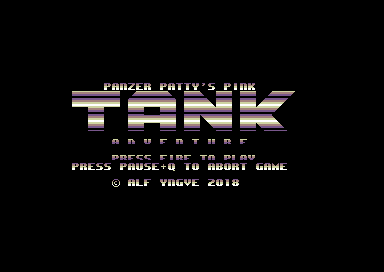 You control Patty's tank. Drive it through her neighborhood while fighting the Forces of Darkness Sorority. The enemy attacks with remote-controlled tanks and helicopter drones. Occasionally you will notice small drones pestering the residents. Shoot 4 small drones to gain a bonus life. You are NOT allowed to shoot ordinary cars, so just avoid them. When you hear a warning signal, a GREEN helicopter drone is nearby. 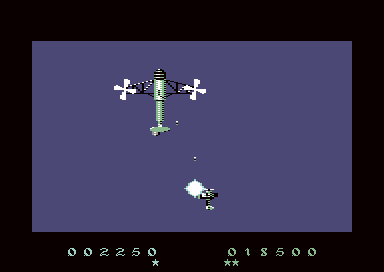 If you fail to shoot down green helicopter drones, you will lose lives for the Shooting Stage that follows later! Using the gun crosshairs, you must shoot ALL enemy drone tanks and helicopters before they shoot you. If you miss a single enemy, you will start losing lives very fast. If you survive the Shooting Stage, Patty wins the day! IMPORTANT: Don't linger! Enemy vehicles will cause damage to your tank if you don't destroy them fast enough. If you get too much damage, your tank will slow down and you will be unable to defend yourself during the Shooting Stage. You can abort the game by pressing RUN/STOP (=Pause) and then pressing Q. Humans have been transported across to a new moon, CETI 21. For many years, humans settled on this planet. However aliens also tried to invade it. A security system at Sentinel Security Plant was set up in order to thwart future alien attack. Unfortunately, after a recent computer OS update, the system crashed - prompting shut down to all defences. Unfortunately aliens decided to take advantage and start an invasion on CETI 21. They breached the security systems, entered the inner core and rigged the mainframe with one of their own. Now the defence systems have turned against the human race. Your mission is to control a low level flying drone, ULTRAX 18 through 3 sectors and do battle against the aliens and rogue defence security systems. Then locate the aliens' mainframe supercomputer and destroy it. Once you have destroyed it. 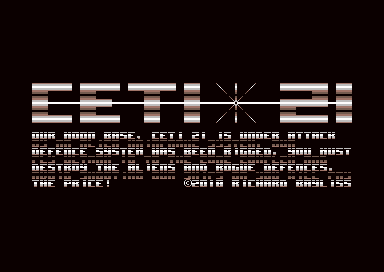 Peace and stability across CETI 21 will be restored. Avoid shooting drones, parked on the runways - otherwise you will have to pay the price. Good luck commander. Deep in the hearts of the forest. Lived a boy, called Eddie. He was a natural born adventurer. He loved going on adventures. That was until one day. News passed by, an Evil wizard had transformed cute forest creatures into deadly evil mutants. Armed with stones, Eddie sets off on a quest, to locate the evil wizard's castle and put an end to his evil spell. Guide Eddie through the woods to the castle, throwing pebbles at the mutants and guards. Pick up treasure. Eddie can also enter the water as well as walk through the woods. Watch out for the mutant's poison, or the enemies weapons. Defeat the wizard to break the spell. Extra lives are awarded for every 10,000 points scored. Good luck! Here are the final results of the Official SEUCK Compo 2018. The prize is under development, and the final prize package will be released. Also I have done away with the comments from the SEUCK Compo voting form. The idea to have published those was a big mistake. Sorry about that! Congratulations goes to Eleanor Burns with Valkyrie 3. This game was voted as the winner. Also well done goes to Gaetano Chiummo with Dream World and VOX VG with Battle in the Woods. A huge thank you goes to the rest of the entrants who worked hard on their own SEUCK game creations, specially for this compo. Finally, a little bonus .D64 (Well .D82 really) for those of you who own theC64 mini. Simply copy thec64-drive8.d64 to your USB stick. Load a game from the carousel on theC64 mini. Insert the USB stick. Then exit the game. Then load BASIC and type LOAD"*",8 and then RUN. Now pick a program from the menu and enjoy. 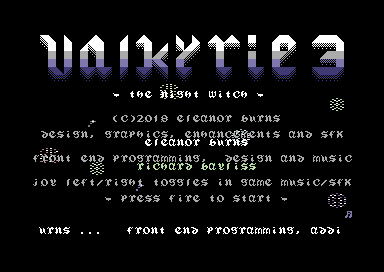 The Official C64 Compo winner, Valkyrie 3 now features additional enhancements, such as loading picture, some exclusive loading and in game music, a new front end, high score table, single score panel and a whole lot more. Unfortunately, due to compatibility issues with all of the incredible enhancements inside the game, which Eleanor added herself. 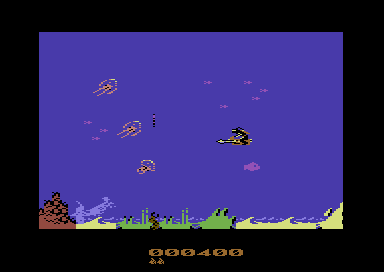 A SEUCK Redux version of this game has not been made, for compatibility issues. Still, don't let this put you off. A lot of effort was really put into this game, and with the additional front end, linked score and high score table. 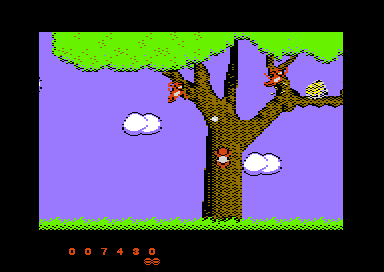 It feels much more like a full Commodore 64 game. Here are a couple of screen shots from the ehanced version. The official Sideways Scrolling SEUCK Compo, which I ran in 2010. After the success of the last Sideways SEUCK Compo in 2010, I did it again with yet another sideways SEUCK Compo in 2011. Which was yet again, another successful competition. After a long break in 2012, with not so much going on ;)... This competition started as a mixed SEUCK compo, and was quite a success. Catering for both normal, and sideways scrolling versions of SEUCK. The second mixed SEUCK Compo which was launched in 2014. Another quite successful mixed SEUCK Compo 2015. Despite having to increase the deadline now and then for submissions. A mini SEUCK compo, which catered for only the sideways scrolling SEUCK compo. A very successful mixed SEUCK Compo 2016, which also ran over to start of the year 2017. Some real stunning entries also. Run by Errazking, which I stepped down for a year or so. 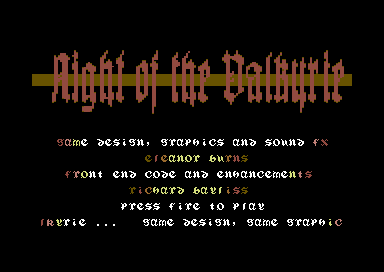 Features a whole lot of new SEUCK compo entries and also catered for other systems as well as the Commodore 64. Some nice games, some pretty old ones as well. A SEUCK fan web site, run by Andrew Fisher, featuring a large archive of previously seen/unreleased SEUCK games. Also includes some additional articles, tips and tricks. My very own SEUCK enhancement tips page, including various POKEs and assembly / ML listings to help boost the improvement of SEUCK game creations. 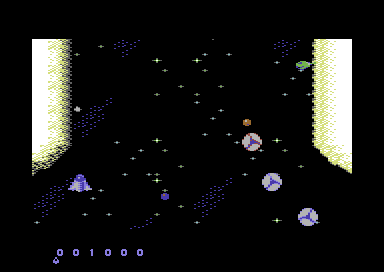 Also includes the C64 framework for SEUCK, and a few other bits. 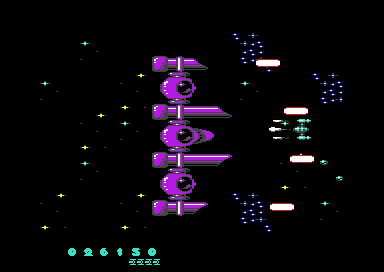 Jon Well's adaptation of the original Shoot Em Up Construction Kit. 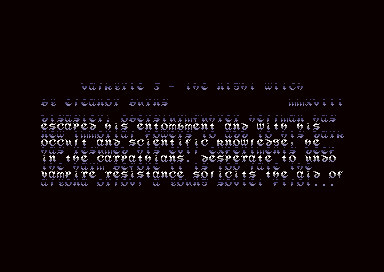 Create C64 games, which can scroll across the screen instead of downwards. Also comes with an example game demo called 'Breakthrough'. Current version only scrolls from left to the right, but is still worth checking out. Included on the page, Imaginator and Nyaaaah! 11, for you to play or work files, which you can muck around with. Martin Piper's open source framework for SEUCK games, and other bits. With this frame work, you are able to make SEUCK games more stable, and use better pixel perfect collision. You will be required to use the ACME cross assembler compiler (Martin's version is available), and a lot of programming knowledge.